New on "Vagaries": Mars Weather ! The Opportunity rover has captured an image of a dust devil, and surprisingly, this is the first one ever that Oppy has spied. Spirit has seen dozens of dust devils over on the other side of the planet in Gusev Crater, and even the Phoenix lander's camera captured several of these whirling dust dervishes during its short four-and-a-half month life. 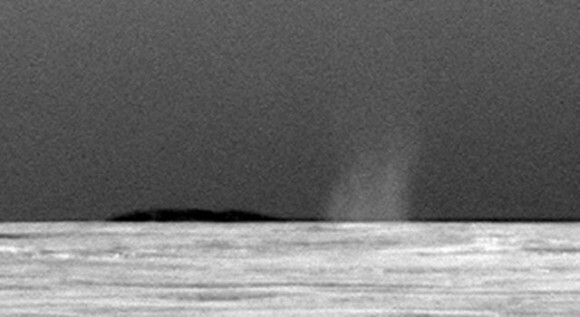 Plus the different orbiting spacecraft have seen evidence of plenty of dust devils by using their eyes from the skies. But this is the first one Oppy's cameras have managed to shoot. This tall column of swirling dust appeared in a routine image that Opportunity took with its panoramic camera on July 15, 2010. The rover took the image in the drive direction, east-southeastward, right after a drive of about 70 meters (230 feet), and was taken for use in planning the next drive. But obviously, over the years, Opportunity has benefited from dust devils – or perhaps just gusts of wind – as she has had a series of unexpected boosts in electrical power when the pervasive Martian dust gets cleaned off her solar panels. And just one day before Opportunity captured this dust devil image, wind cleaned some of the dust off the rover's solar array, increasing electricity output from the array by more than 10 percent. These unexpected – but welcome – Martian "car washes" have helped extend the life of both rovers. "That might have just been a coincidence, but there could be a connection" between the cleaning event and the dust devil in the image, said Mark Lemmon of the rover team from Texas A&M University. The team is resuming systematic checks for afternoon dust devils with Opportunity's navigation camera, for the first time in about three years". Please give feedback if readers are interested in "vagaries" write up on Mars Weather.I would also welcome more such info. from readers. what does dust devil mean?? i think (not too sure), a dust devil on mars is a dust circulation rising upwards.